Happy Thanksgiving everyone. 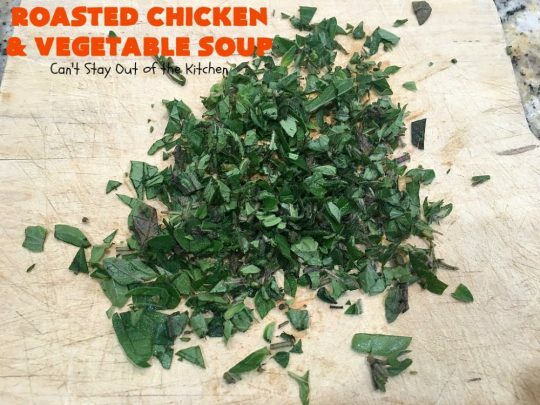 I have a terrific soup recipe for you today. This can even be made with leftover turkey, if you desire. 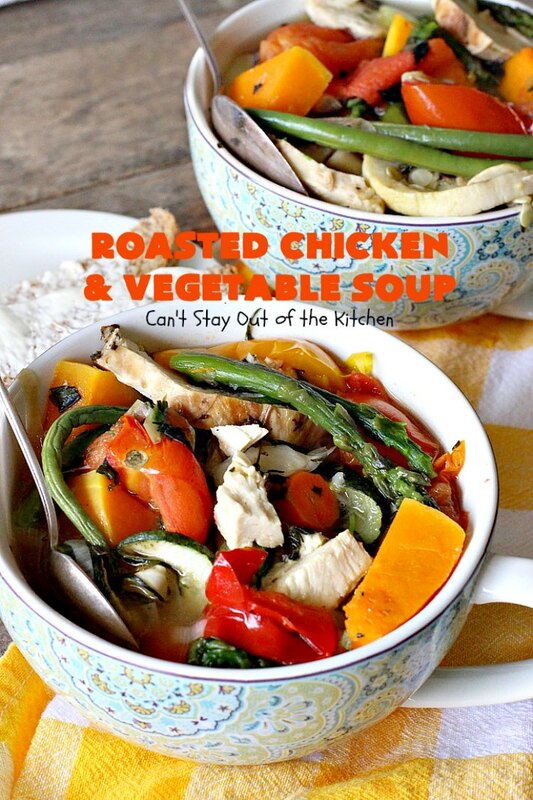 Roasted Chicken and Vegetable Soup is so delicious. 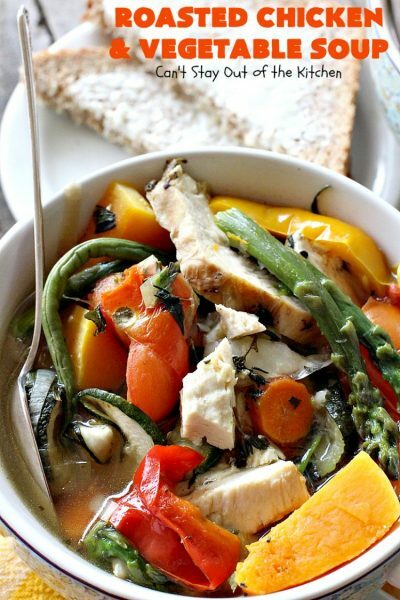 It’s filled with grilled chicken and lots of roasted veggies seasoned with fresh thyme, rosemary, basil and oregano. This is wonderful comfort food now that fall and winter is upon us. It’s also healthy, low calorie, clean eating and gluten free. If you are unable to grow or find fresh herbs this time of year, you can substitute dried (but only about one-third as much). Here in Texas, my herbs are still going strong! Back in October I made my famous New England Clam Chowder for one of our Friday night care groups. 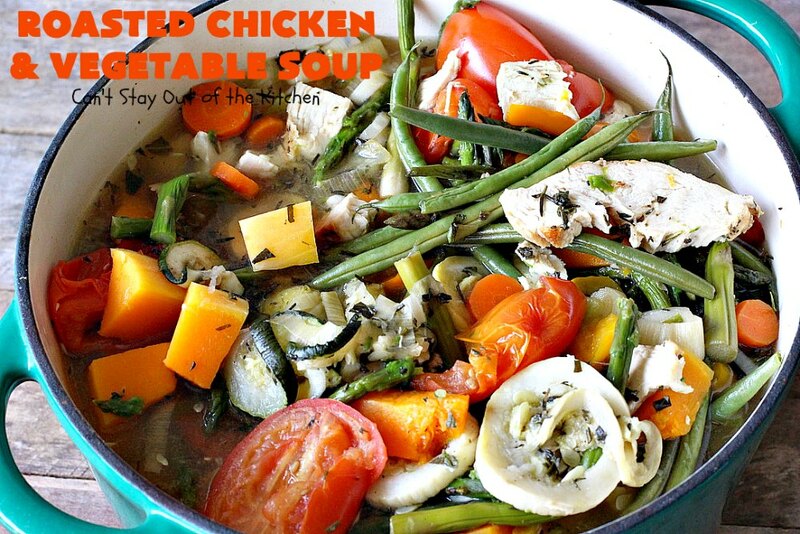 It is my favorite from scratch recipe for that delicious soup. Unfortunately, one of the gals in our group doesn’t do fish. So I came up with this Roasted Chicken and Vegetable Soup for her. It had roasted green beans, asparagus, carrots, tomatoes, leeks, bell peppers and butternut squash. 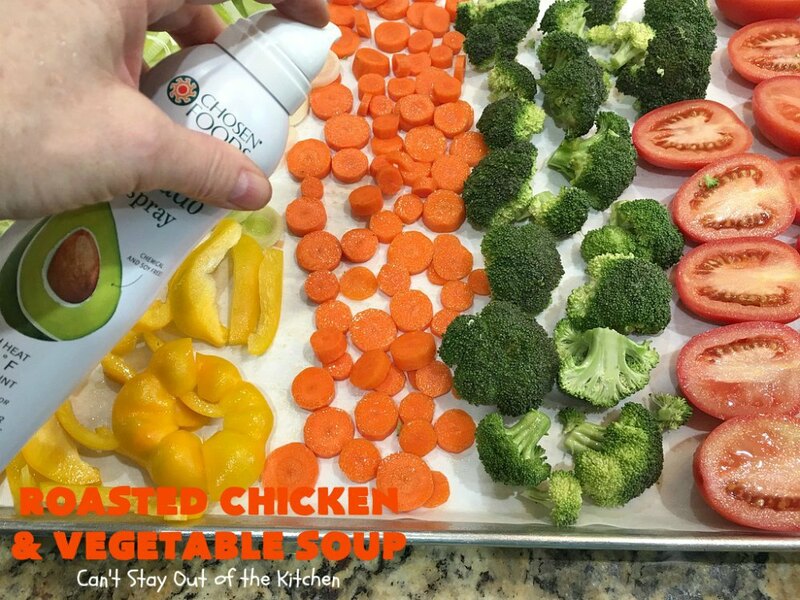 The veggies were sprayed with either olive oil or avocado cooking spray first. Then they were sprinkled with salt and pepper and the freshly minced seasonings. 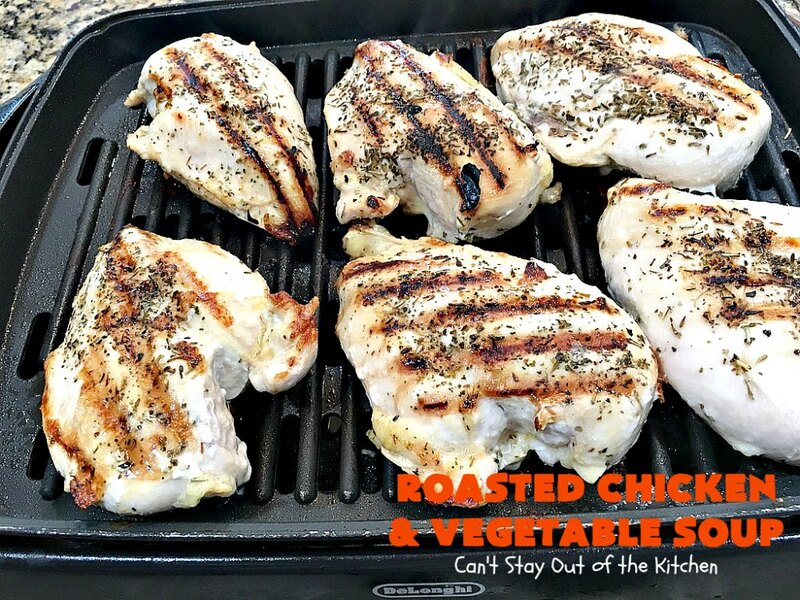 I grilled chicken with Italian seasoning, and this recipe was born. I’ve been working through the 80 Day Obsession workout. 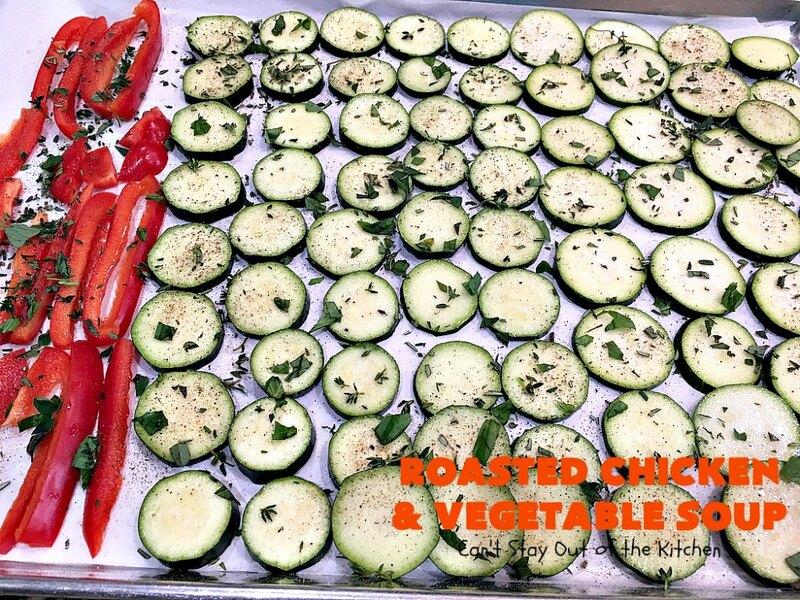 Part of what I did to prepare beforehand, was to roast up a lot of fresh veggies and grill meat. That way, I wouldn’t have to worry about any prep work during the week. I used up veggies and meat I had already prepared for 80 Day Obsession to pull off this tasty soup recipe. 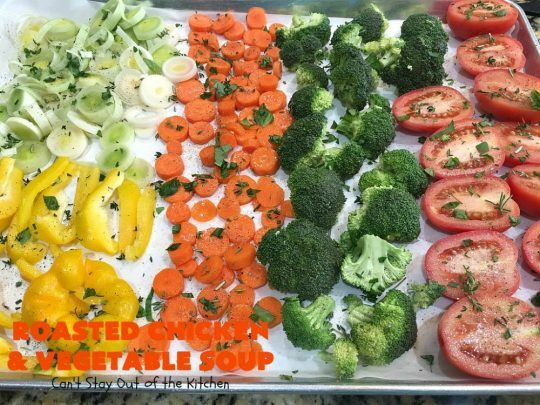 Everyone in our Bible study care group sampled both soups. While I expected to get rave reviews over the New England Clam Chowder, I was surprised when this soup recipe was also such a big hit. Because I had made two different soups that night there were leftovers. So I parceled them out between two different families so they could enjoy the soup again. 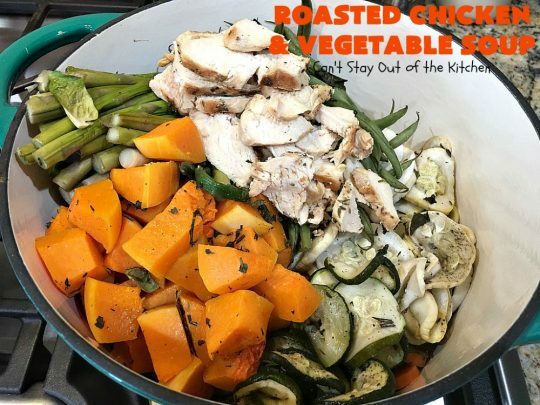 If you are planning on roasting or grilling meat and veggies for the upcoming week, this is the perfect recipe for you. While the pictures below show the process, they do not reflect how much of each item I used to make the recipe. Check the recipe instructions carefully. 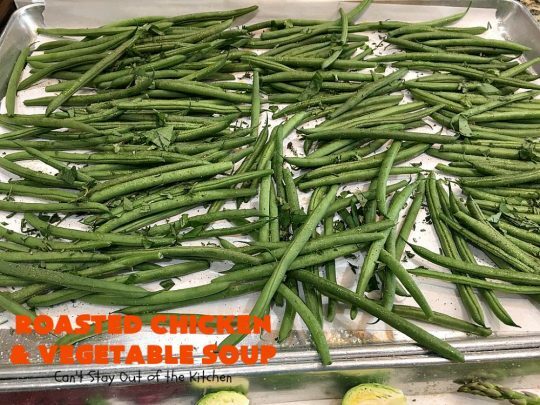 If you plan only to make enough for the soup, you may end up with only one large cookie sheet (18×26″) with all the veggies on it. (Instead of the six or eight cookie sheets of fresh veggies I was making). 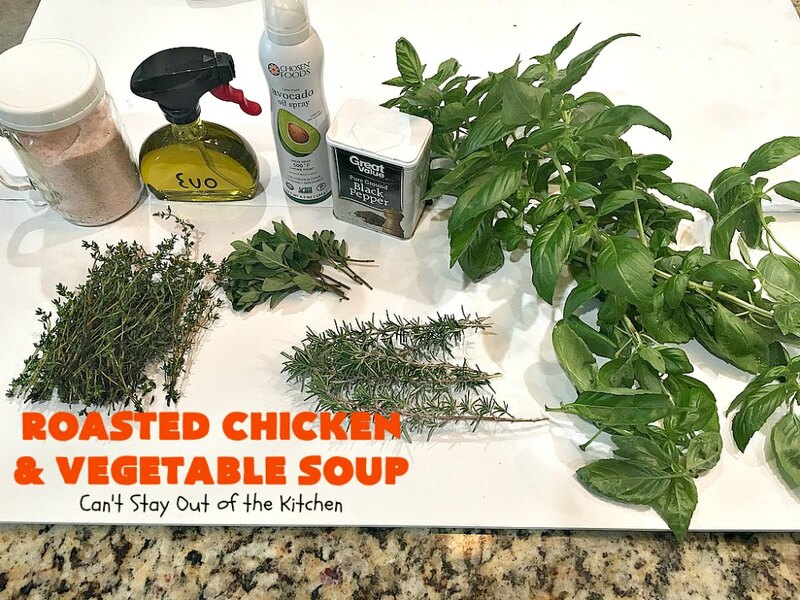 🙂 If you’re in the mood for something warm, comforting and totally satisfying, give this tasty Roasted Chicken and Vegetable Soup a try. 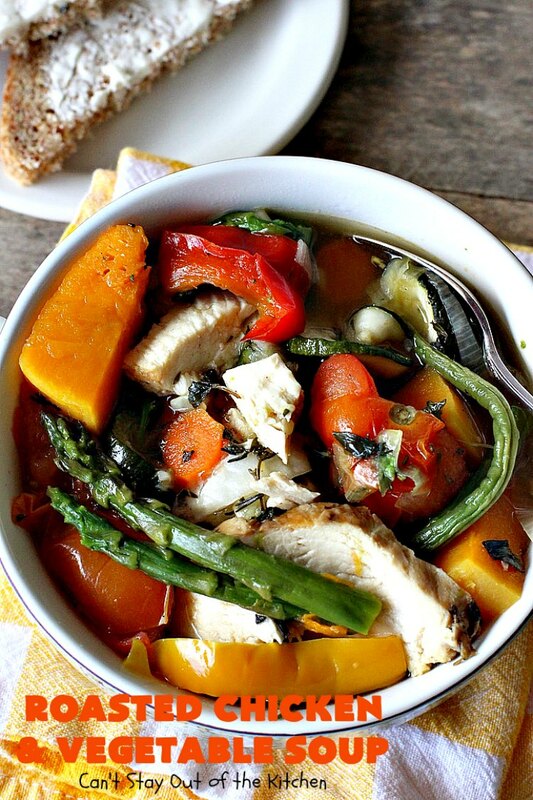 Our company loved the savory flavors of this soup. I left the veggies in large pieces rather than cutting them down. That’s a personal preference issue. You can always cut them into smaller pieces if you desire. 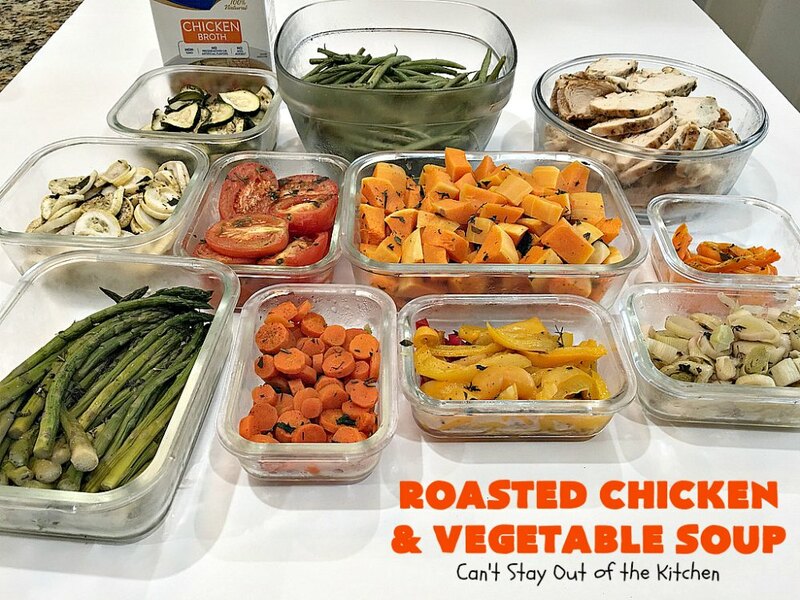 I used these ingredients: seasoned asparagus, carrots, bell peppers, leeks, butternut squash, tomatoes, green beans, zucchini, yellow squash, chicken broth and grilled chicken seasoned with Italian seasoning. 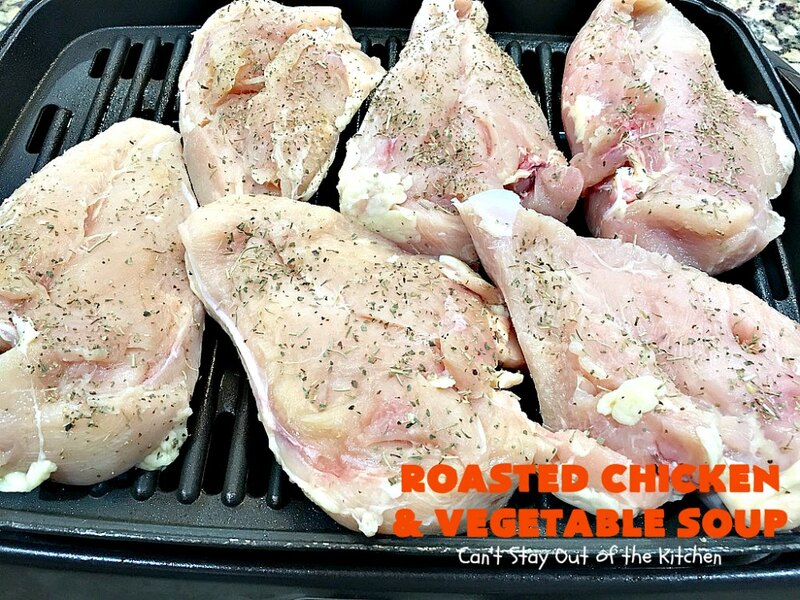 Season both sides of boneless chicken breasts with Italian seasoning. Grill until both sides are done and chicken is cooked through. Because my chicken breasts were large, they took about 30-40 minutes to cook thoroughly. Allow to cool a few minutes. Slice down and set aside. 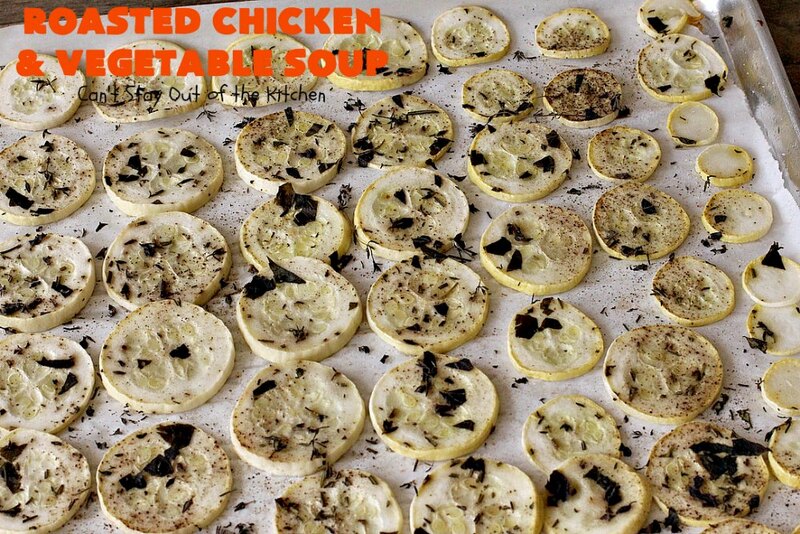 (You will not use this much chicken for this recipe). I used these ingredients to season the veggies: olive oil and avocado spray, pink Himalayan seas salt, pepper, fresh thyme, fresh basil, fresh oregano and fresh rosemary. Mince as much rosemary as desired. Set aside. Mince as much basil as desired. Set aside. Mince as much oregano as desired. Set aside. Mince as much thyme as desired. Set aside. 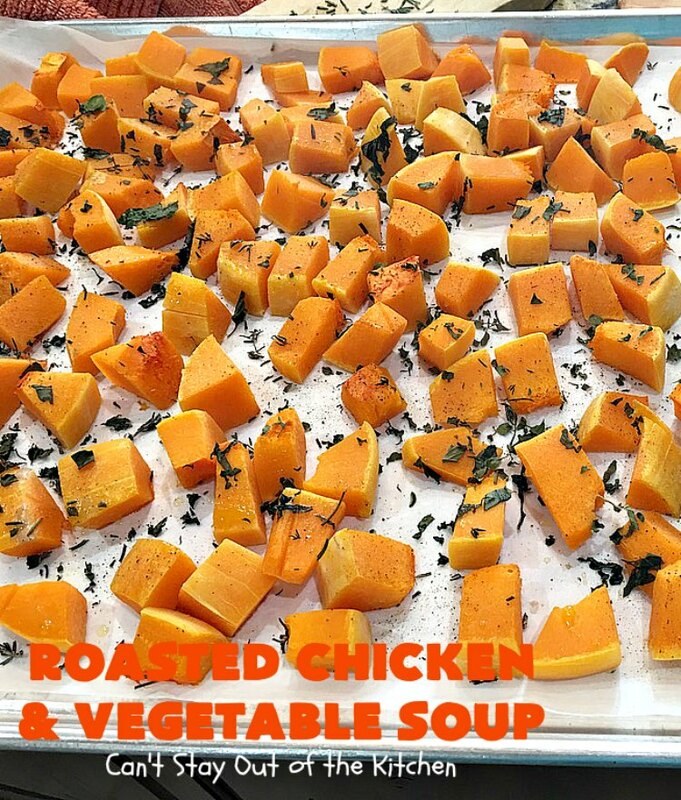 Pare and cut down butternut squash. Place on a parchment paper-lined cookie sheet. Drizzle with avocado spray. 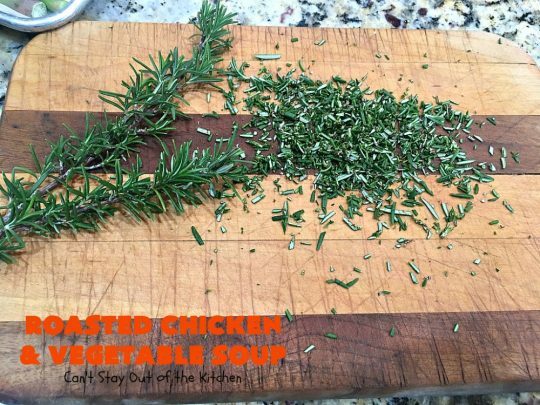 Sprinkle with salt, pepper, basil, thyme, oregano and rosemary. 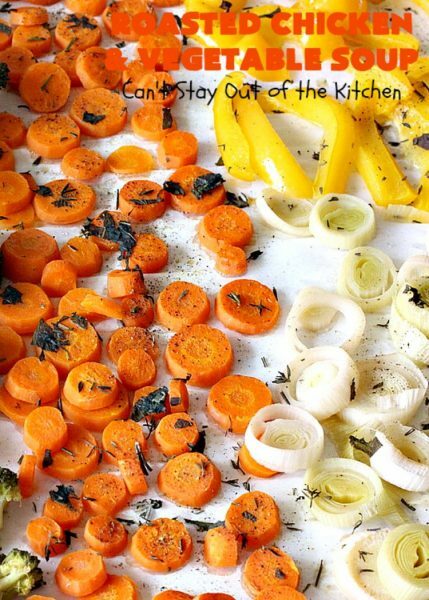 Roast veggies at 350 about 30-45 minutes or until tender. Set aside. You will NOT use this much butternut squash. 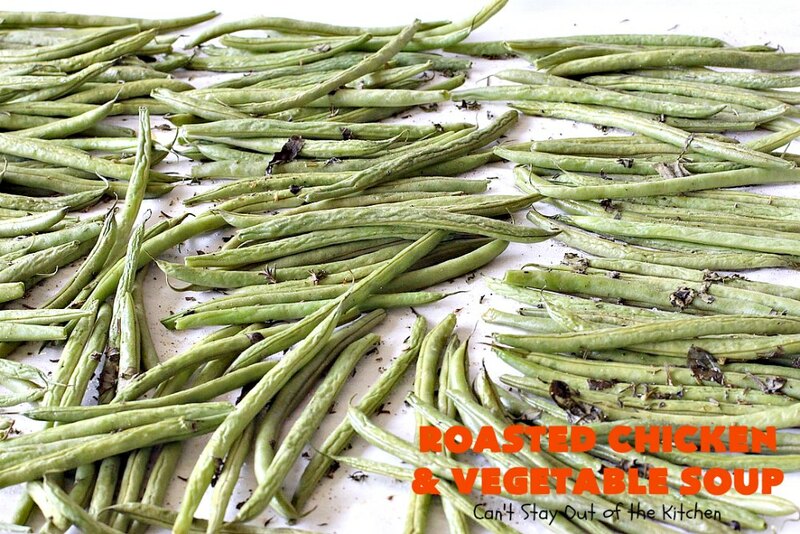 Wash and cut tips off the ends of the green beans. 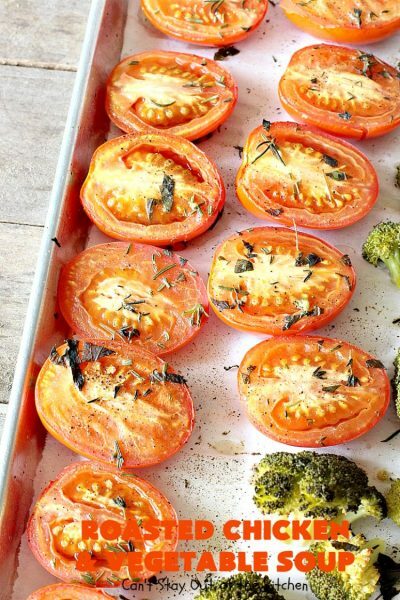 Place on parchment paper-lined cookie sheet. Spray with avocado spray. Sprinkle with salt, pepper, basil, oregano, thyme and rosemary. You will not use this many green beans. Place leeks, bell peppers, carrots and tomatoes on a parchment paper-lined cookie sheet. (I did NOT use the broccoli for this recipe). Spray with avocado spray. Sprinkle with salt, pepper, basil, oregano, thyme and rosemary. Roast tomatoes at 350 about 30-45 minutes or until tender. Set aside. Roast asparagus at 350 about 30-45 minutes or until tender. Set aside. 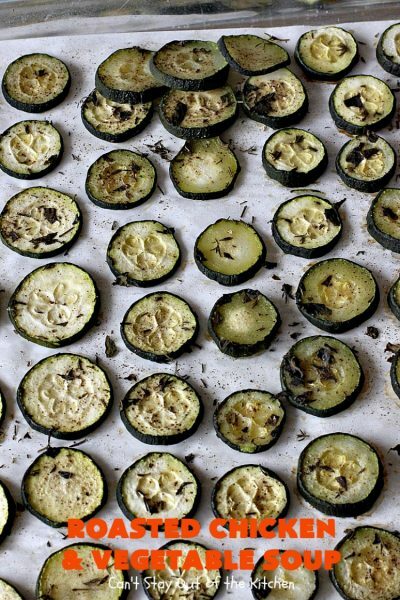 Place zucchini on parchment paper-lined cookie sheet. Spray zucchini and bell peppers with avocado spray. Season with salt and pepper, basil, oregano, thyme and rosemary. You will not use this much zucchini. 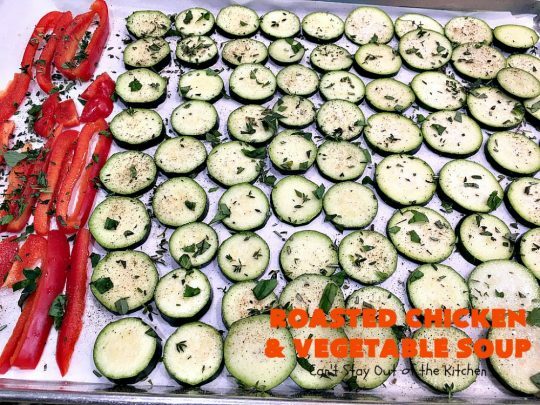 Place bell peppers and yellow squash on a parchment paper-lined cookie sheet. Spray with avocado spray. Sprinkle with salt, pepper, basil, oregano, thyme and rosemary. You will not use this much yellow squash. Place seasoned bell peppers (yellow, orange and red), carrots, tomatoes and leeks in a large Dutch oven. Add green beans, asparagus, yellow squash, zucchini, butternut squash and chicken. 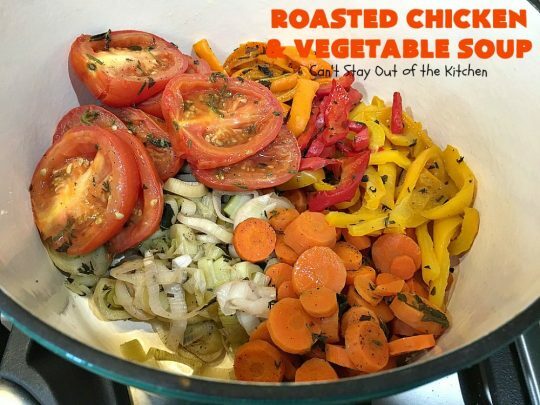 Cover with lid and cook over medium heat until veggies are hot, about 15 minutes. Since my veggies had been refrigerated, they took a little longer to heat up. Roasted Chicken and Vegetable Soup is healthy, low calorie, gluten free and clean eating. 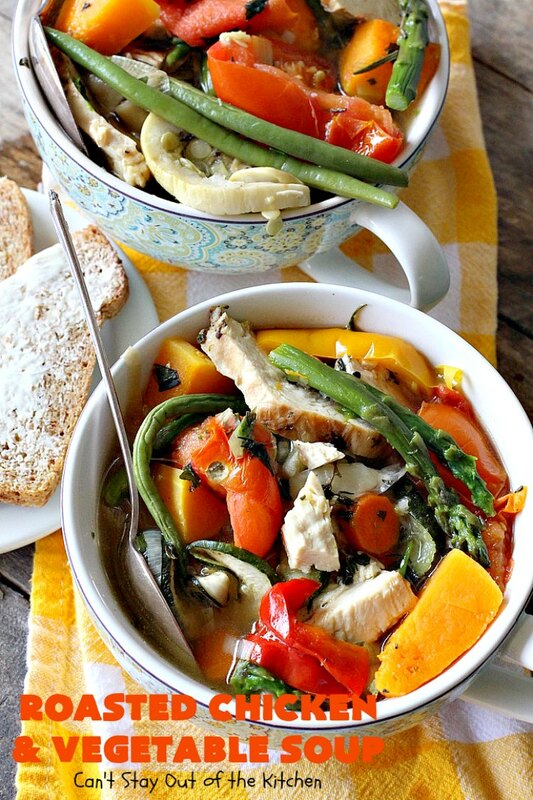 It’s not seasoned with preservatives or canned soups that add hidden calories and ingredients. The seasonings of fresh basil, oregano, thyme and rosemary make this soup taste extra special. This is also a terrific soup to make with leftover turkey! 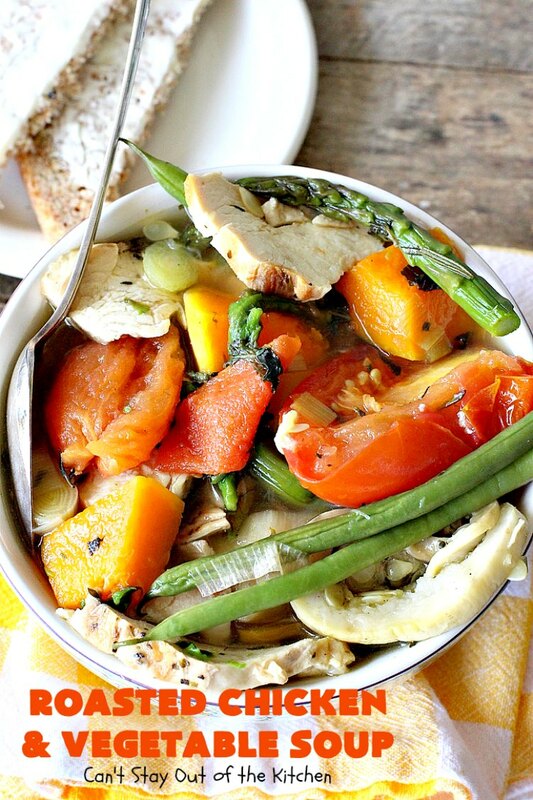 Roasted Chicken and Vegetable Soup is made with grilled chicken and seasoned roasted vegetables. 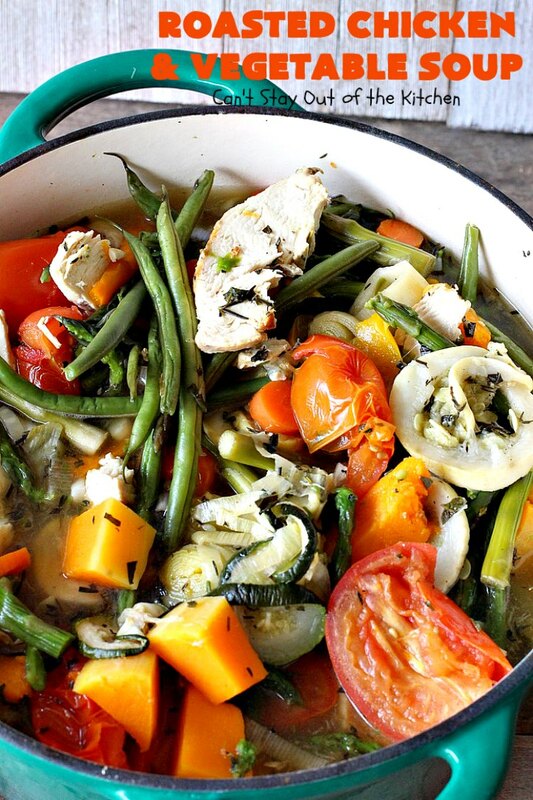 Vegetables are pre-roasted with fresh oregano, thyme, basil and oregano. This soup uses asparagus, carrots, green beans, butternut squash, leeks, yellow squash, zucchini and tomatoes. 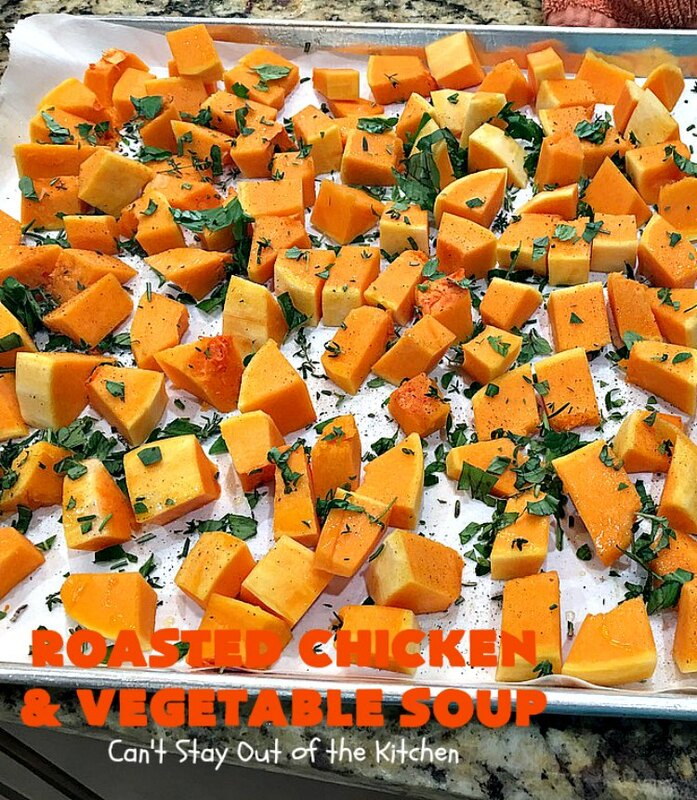 It's healthy, clean eating, low calorie, gluten free and a great meal idea for 80 Day Obsession. 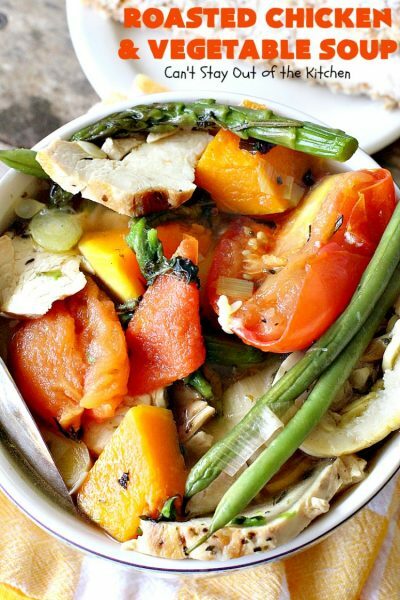 Combine ingredients in a large Dutch oven. Heat over medium heat until veggies are hot—about 15 minutes. NOTE: My veggies and meat had been refrigerated so it took longer to heat the soup. 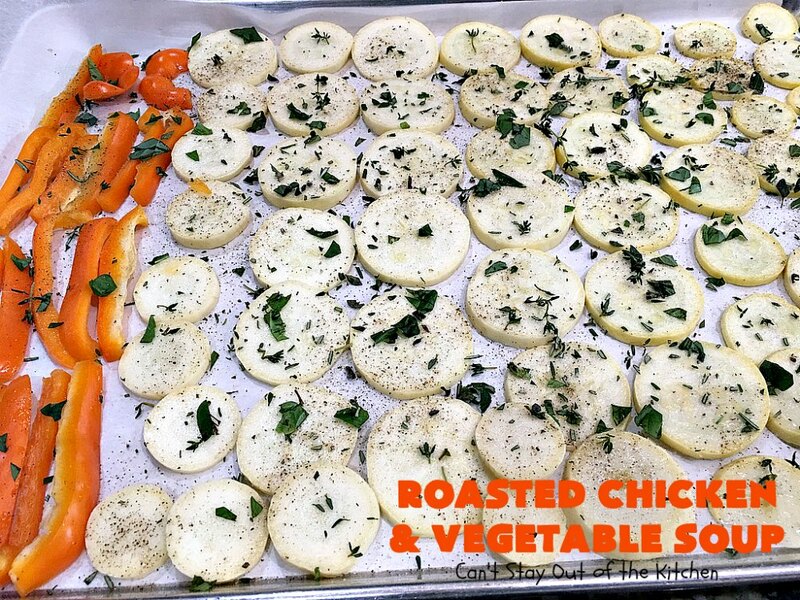 NOTE: Place veggies on parchment lined paper on large cookie sheets. 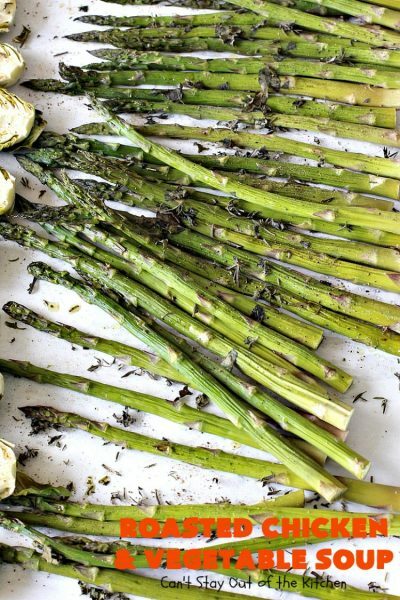 Spray with olive oil or avocado oil cooking spray. Sprinkle generously with salt, pepper, freshly minced basil, thyme, rosemary and oregano. 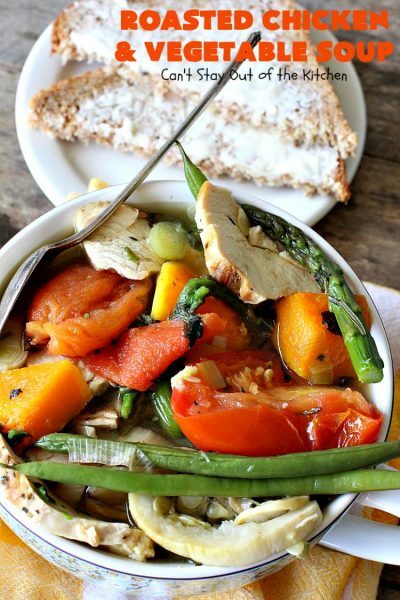 Bake at 350° for about 30 minutes or until veggies are tender. NOTE: Sprinkle both sides of two chicken breasts generously with Italian seasoning. Grill over hot heat about 20 minutes each side, until done. 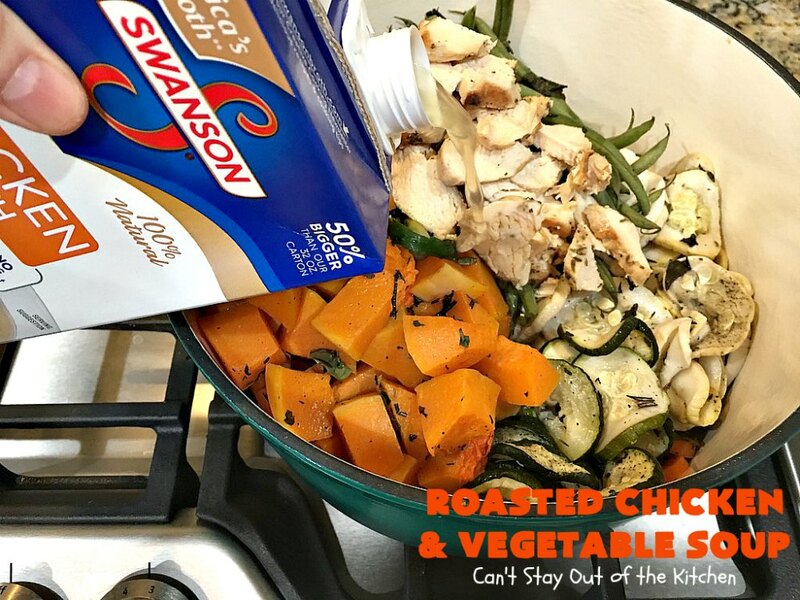 Check with meat thermometer to make sure chicken is completely cooked through. 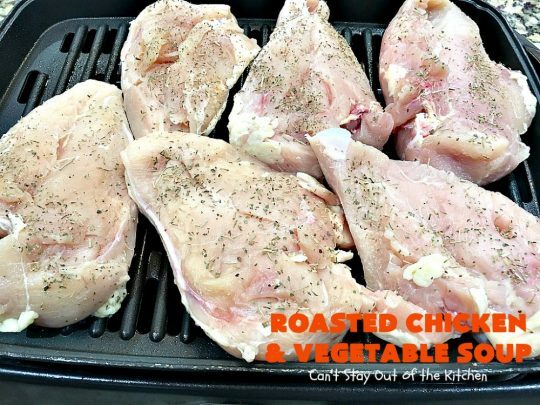 Remove from heat and slice chicken breasts down on cutting board. 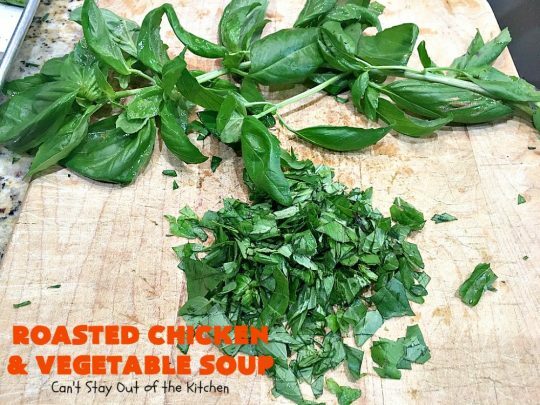 Add to soup as desired or use with salads or other recipes. 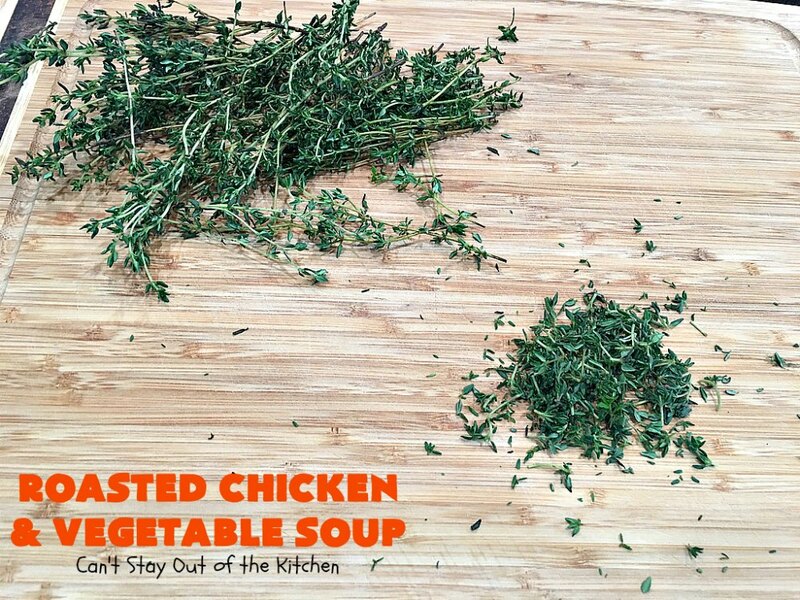 NOTE: I used fresh herbs but dried herbs can be substituted. NOTE: For a vegan version, omit chicken and substitute vegetarian chicken broth. NOTE: Be prepared! This recipe calls for chicken to be grilled and veggies roasted in advance. Plan your time accordingly! This will probably add an additional hour onto preparation time. 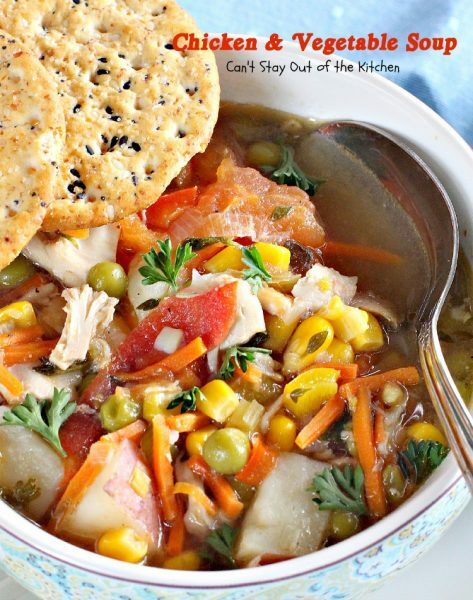 Roasted Chicken and Vegetable Soup is delicious comfort food for fall or winter. Our company raved over this tasty soup.